I recently bought a new laptop and the Windows 7 OS was installed by the vendor from whom I have purchased it and it is registered with the name of their company, but now I want to change it to mine, Is that possible? How to do it? What to do if getting an Error message Class not registered in Windows 7? Re: How to change the Registered User information in my Windows PC? STEP 1: Open run command from start or Windows key + R and type regedit and Click OK. STEP 2: Navigate to HKEY_LOCAL_MACHINE -> Software -> Microsoft -> Windows or Windows NT(According to your installation) -> CurrentVersion -> select RegisteredOwner and Registered Organization and change it which you desire. STEP 3: Restart your machine once for it to reflect. Yes, It's possible to change the registered used information in your windows pc. following these steps. >>open run command in that command to type regedit and click ok.
>>Navigate to HKEY_LOCAL_MACHINE-> software->microsoft->windows or windows NT->currentVersion->select Registered Owner and registered organization and change it which you desire. >>Then restart your windows pc. 1. Open "Run" in your PC. 2. Now type "regedit" Click OK.
Click on HKEY LOCAL MACHINE . When you click on Window NT, you will current version folder, and on right side, you will see "RegisteredOwner" link, you will click it, a new box will pop up, here name whatever you want to be the name of your PC Owner. If you’ve ever wondered how to change the name of the person that Windows is registered to, this is the quick tip for you. it might come in handy if you got a computer from somebody else. 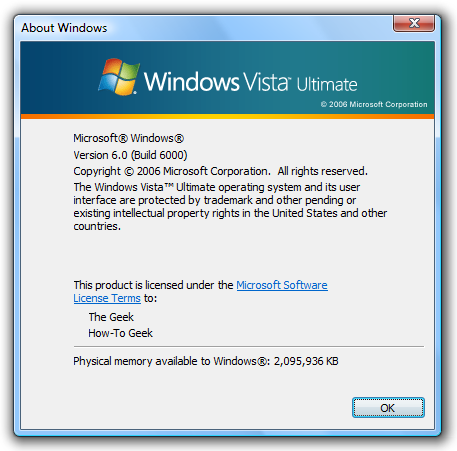 By following the steps below you will be able to edit the registered user and company name for either a Windows XP computer or a Windows Vista computer. To begin, first verify the registration details of your Windows computer. For Windows XP and Windows Vista click on Start and right-click on My Computer (just Computer). You will see the screen shown below. In order to change your registered user name, you will need to edit this information in your registry. Editing the registry has the potential to cause serious (and unrecoverable) damage to your PC. If you are at all uncomfortable editing the registry, please do not attempt the following. In Windows Vista, open your registry by clicking the Start Menu and typingregedit. Windows will prompt you for confirmation before running the Registry Editor. In Windows XP, open your registry by going to Start and then Run and typing regedit. Continue to navigate through the registry by untying the following tabs: Software, Microsoft,Windows NT, Current Version. The Current Version will have two editable sections calledRegisteredOrganization and RegisteredOwner. In order to change either of these fields double click the field name and enter your information in the "Value data" section and click ok. When you are satisfied with your entries, exit the Registry Editor and your new values will be present when you open MY COMPUTER PROPERTIES. 3. Type regedit in the textbox and click OK. This should work in all versions of Windows, including Windows 7. This does require playing with the registry. If you are not comfortable and experienced with this, back up your system first. 9. In the value data field, change the name to whatever you wish. You may also delete this text and just leave this field blank. you will see "RegisteredOwner" link, you will click it, a new box will pop up, here name whatever you want to be the name of your PC Owner. # click Exit on the File Menu to quit registry editor. The registered user information can be changed by the account settings provided in the control panel and also it should be done with the changes in the account.The process is that go to the control panel options and then you can change the user's information and account settings there you can make changes of passwords and account details. Friend, you can change the settings regarding user information in Control Panel. Every change you want to make regarding System, User Account and Administrator, you should go to Control Panel. There you can find the User's information by going to Account Settings. It asks for what changes you need to make and do that changes. You can also change the password of the user in the similar way. Off course, you can change the Registered User information in my Windows PC. Open Run Command Prompt from Start Windows & Type regedit and Click Ok.
Navigate to HKEY_LOCAL_MACHINE _Software_Microsoft_Windows_Current Version_select Registered Owner & Registered Organization. Just Change it According to your Wish. Restart your PC & Check Back Now. 3.HKEY_LOCAL_MACHINE\SOFTWARE\Microsoft\Windows NT\CurrentVersion. As always,backup your registry before making changes,just in case. 1.click start menu type regedit in to the search programs and files box.this will bring up the windows7 registry. 2.depending on your settings,you may have to verify that you want to run the registry editor. 4.double click on registered owner and change the keys string value to what ever name you want. 5.now when you check the name owner by clicking the start button by typing winver into the search box,your new name will appear instead of your old name. 6.keep in the mind that this trick is cosmotic only; it does not change the actual owner of the Windows 7 license in the legal sense. It also does not change the licensing relationship you or anyone else has with Microsoft. 1: Open run command from start or Windows key + R and type regedit and Click OK.
2: Navigate to HKEY_LOCAL_MACHINE -> Software -> Microsoft -> Windows or Windows NT(According to your installation) -> CurrentVersion -> select RegisteredOwner and Registered Organization and change it which you desire. these steps are as follow..
2.now you can find the registered owner and registered organization keys in the right hand pane.change them to what ever values you want. 3.to show of the new changes just type winver.exe into the start menu search box to see the about the windows box. Click on the HKEY LOCAL MACHINE . 5.in the right pane,double click registered organization,.under value data,type the name that you want,and then click ok..
7.in the right pane,double click the registered owner,under value data,type the name that you want.....and then click ok. Yes, you can do it by doing a Minor Change in the Registry. For this, Open Run Command in your Windows. Just open and type regedit and then press OK button. Now, navigate to HKEY_LOCAL_MACHINE-> software->microsoft->windows or windows NT->currentVersion->select Registered Owner and registered organization and then click on Rename button to change the Registered User and Company. HKEY_LOCAL_MACHINE\SOFTWARE\Microsoft\Windows NT\CurrentVersion. As always, back up your registry before making changes, just in case. 4th==Type regedit in the textbox and click OK.
6th==click double on Registered Owner. 7th==now change the name & click ok.
8th==You may also delete this text and just leave this field blank. 9th== Exit regedit and log off . 1.Firstly open the 'run' and type 'regedit' and click 'OK'. 2.Then you click on the option 'HIKEY_LOCAL_MACHINE'. 3.Later you click on the option 'Software' and then 'Microsoft'. 4.Then you click on 'Windows NT'. 5.Then you click on the option 'CurrentVersion'. 6.Then at the right side of your screen you can see many files. 7.Then you double click on the option 'RegisteredOwner'. 8.Now you change the name as you like and click 'OK'. Then close the window and then restart the Windows PC once. By following the instructions you can change the registered user information. after that enter your name .... and click on Change Name ..
==>Then type "regedit " in the prompt and then press "enter "